Commuter airline Surf Air has received permission from the Federal Aviation Administration (FAA) to start flying a new approach to the San Carlos Airport, sending its planes over the Bay from Moffett Field past the Dumbarton Bridge whenever conditions allow, starting on Tuesday, July 5. The new approach route approved for Surf Air (green line) will take planes over the Bay to the San Carlos Airport from near Moffett Field when conditions allow a visual-flight-rules (VFR) approach and flights into other airports don’t interfere. The route that would continue to be used when visibility is bad is the straight red line, and the shaded area is currently used by Surf Air pilots in VFR conditions. Almanac graphic by Kristin Brown. 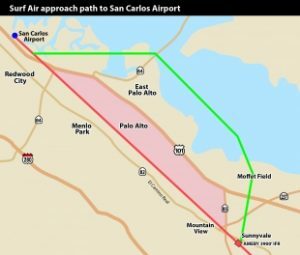 The FAA on June 20 told San Mateo County, which owns and operates the San Carlos Airport, that the modified approach to the airport, which the county had asked for as a “noise mitigation measure,” can be used as a test for six months. County Airports Division Manager Gretchen Kelly said that at the end of the six-month period the FAA will decide whether to implement the new route on a permanent basis based on its operational effects, environmental consequences and community reaction. The airline will be allowed to use the new route whenever conditions allow a visual approach to the airport and when flights do not interfere with other flights into nearby airports. Officials at the San Carlos Airport told the Almanac that a review of a year of weather records show that the approach could have been used 86 percent of the time in 2015. Jim Sullivan, Surf Air’s senior vice president of operations, said the airline will start using the new route on July 5. Sullivan said the airline has been ready to use the new route since the end of May, but was waiting for approval from the FAA. Surf Air had its “check pilots,” who train other pilots, fly the route 31 times to evaluate it, and had “nothing but positive comments,” he said. San Mateo County Board of Supervisors President Warren Slocum, who represents the North Fair Oaks area that has generated many noise complaints about the Surf Air flights, said the county will be careful to note if the change in route generates noise complaints from other areas, such as the neighborhoods that lie between the current route and Moffett Field. Kelly said the San Carlos Airport received only one noise complaint during the 31 test flights of the route in May; that was from a resident in Redwood City. She said the aircraft was approximately one lateral mile from the caller’s home. Slocum said the board is also working on longer-term solutions to problems at the airport. While a report from consultants hired by the county to look at the airport will be presented on June 28, he said specific ideas and recommendations for action will not come back until October. Slocum said he and Supervisor Don Horsley, who represents the district including the airport and Atherton, which has also generated many complaints about Surf Air noise, have spent a long time working to resolve the issues. 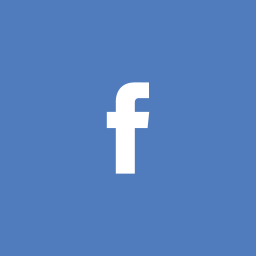 The county, and other local officials and residents, have been working with Surf Air since October 2013, just months after Surf Air started flying scheduled flights in and out of the San Carlos Airport in June 2013. The airline’s small turboprop planes are especially noisy, residents who live under the flight path have said. The success of the airline, which allows its members to take unlimited flights, has led to the addition of more flights. In March, the county supervisors approved a “San Carlos Aircraft Disturbance Study” to look at possible short- and long-term solutions. The county has hired an aviation consultant, an aviation noise consultant and a polling firm to help with the research. Adam Ullman, a North Fair Oaks resident speaking on behalf of the Calm The Skies citizens’ group, said that residents have a number of concerns about the new route as a solution to the problems caused by Surf Air, including the fact that flying it is voluntary and that it can be flown only under certain conditions. Horsley said the county is “conscious of the fact that (the new route) may impact other communities.” He said the mayors of other cities Surf Air could begin flying over will be notified of the test. “We don’t really think it’s fair to transfer the noise from one neighborhood to another,” he said. Changing Surf Air’s approach route also does not eliminate all the problems at the airport, he said. The county is monitoring the noise from airport take-offs, which fly over different nearby neighborhoods as well. “That is a little tougher to control,” he said. Horsley said the county is also looking at doing things such as building “additional airport hangars” for small private planes that would leave less tie-down space for planes like the size of the ones Surf Air uses. “We have a big need for hangar space,” he said, adding that there is a waitlist for hangars. Horsley apologized for the amount of time finding a solution has taken. Atherton’s Mayor Elizabeth Lewis said that getting to the new route has taken a lot of work by a lot of people: the resident group, the supervisors, Rep. Anna Eshoo, staff at San Carlos Airport, Surf Air and the FAA. Lewis said she hopes that the supervisors will also look closely at how to best manage the numbers of regularly scheduled flights in and out of the airport and the times of flights. “I believe that it is not suitable for use as a busy commercial airport,” she said.